Obama Admin Sent $221 Million to Palestinians In Its Final Hours – Coercion Code – "Dark Times are upon us"
Hours before President Donald Trump took the oath of office, the Obama administration directed $221 million to be sent to the Palestinian Authority, undercutting Republican opposition in Congress to the money transfer. The State Department, still under the helm of Secretary of State John Kerry at the time, informed GOP members of Congress of the action on the morning of President Trump’s inauguration, according to the Associated Press. The money to send to the Palestinians had initially been approved by Congress in 2015 and 2016, but a group of Republican lawmakers objected to the appropriation. Rep. Ed Royce (R., Calif.), chairman of the House Foreign Affairs Committee, and Rep. Kay Granger (R., Texas), a member of the House Appropriations Committee, had placed a hold on the money after actions by the Palestinian Authority to gain membership to certain international organizations. Congressional holds are not binding actions but are generally respected by the executive branch. 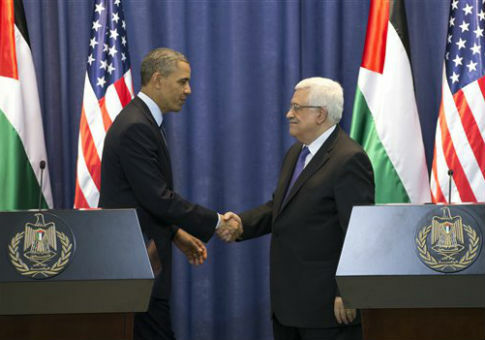 In this instance, however, President Obama had been working to find a way to get the money to the Palestinian Authority, the AP reported. In the same notification, the Obama administration also informed Congress that it would be releasing $4 million for climate change initiatives and $1.25 million for a variety of United Nations programs.